New York, NY, March 15, 2019 – In January, the Buddhist Tzu Chi Foundation received accreditation from UN Environment as an official observer of the 4th session of the United Nations Environment Assembly, also known as UNEA-4, in Nairobi, Kenya. This would mean that, as an active arbiter of environmental protection, Tzu Chi would for the first time have the chance to participate in and contribute to UN Environment policy dialogue, interact directly with represented governments, make oral statements during UN EA discussions, and much more. Tzu Chi’s environmental protection efforts have spawned large-scale community recycling programs around the world, where plastic waste is collected and then turned into products (thanks to the help of Da Ai and Jing Si Technologies) that include clothing, blankets, scarves, and foldable beds. We have used many of these products to benefit disaster survivors during our global disaster relief initiatives. To embrace the responsibility and potential of this role at the UNEA-4, we’ve hosted two side events at the Nairobi Assembly including “From Trash to Treasures: Community-Driven Approaches to Sustainable Consumption” on 3/14, and “Faith, Global Ethics and Climate Commitments; The Fifth Directive of the Parliament’s Global Ethic, Funded Initiative, and the Climate Commitments Project,” today, 3/15. The former highlighted the efforts and successes of the following panelists committed to “#SolveDifferent,” UNEA-4’s theme: Da Ai Technology (Tzu Chi’s environmental technology brand), Solar Cookers International, the Green Fighter, and Jing Si Technology. 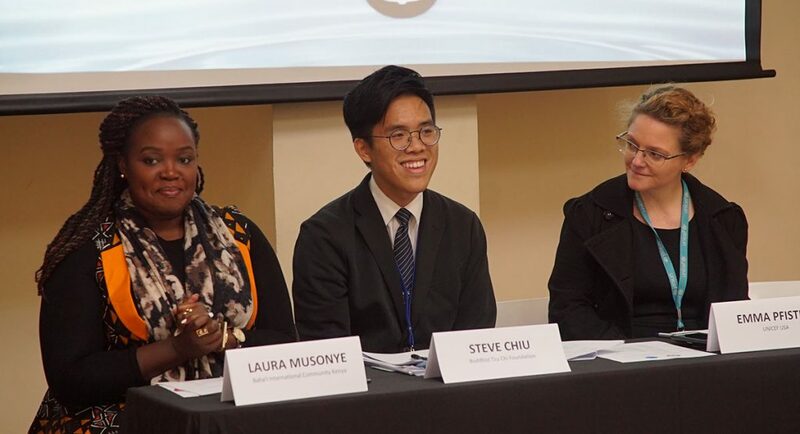 The latter explored the role in which faith and ethics can have and has had in inspiring people to take climate action and relied on the contributions of the United Religions Initiative, Tzu Chi USA, UN Environment, the Anglican Church of Southern Africa, and the Parliament of the World’s Religions. At the United Nations’ 63rd Commission on the Status of Women, also known as CSW63, the Buddhist Tzu Chi Foundation is also actively involved in advancing exchanges on solutions for women and girls by hosting 2 parallel events and a reception in New York City. The first took place on 3/15 and centered on a “Multi-Sectoral Approach: Ensuring Access To Education To All Girls.” It featured panelists from the Bahá’í International Community, the Multi Faith Alliance On Syrian Refugees, the Buddhist Tzu Chi Foundation, and UNICEF USA to discuss the barriers and solutions to education access to girls around the world. The second will center on “Global Citizens – Global Coverage for Women and Girls” on 3/21 (2:30-4 PM at 221 E 51st St, Basement, New York, NY 10022), featuring speakers from the Coalition for Global Citizenship 2030, Make Mothers Matter, Soroptomist International, and LIDÈ, including special guests from Mozambique. The public and media are encouraged to attend. RSVP here. It will be followed by our final event, an evening reception (3/21@ 5-7 PM at the Tzu Chi Center, 229 E. 60th Street, New York, NY 10022) to gather attendees of the CSW, the public, and the media to network over light hors d’oeuvres and refreshments. RSVPs are required. As a humanitarian organization, it is Tzu Chi’s goal to join hands with our fellow global citizens to bring relief with compassion to resolve world suffering.